Since 1972, "Tuskegee" has become a word that stands for an infamous research study: a forty year endeavor on the part of the United States Public Health Service (PHS) to not treat African American men with late stage and presumably non-infectious syphilis, while promising them the aspirins, tonics and diagnostic spinal taps were treatment. The Study turned into a long effort (1932-72) to track nearly 400 men (the subjects) assumed to have the disease and nearly 200 men (the controls) assumed to be disease free in the countryside surrounding the city of Tuskegee in Macon County, Alabama. Despite the publication of a dozen research studies about the Study in medical journals over the years, there was major outrage when a newspaper reporter exposed it to the wider public in July 1972. Senate hearings, a federal investigative commission, a lawsuit, and new rules for medical and scientific research followed. 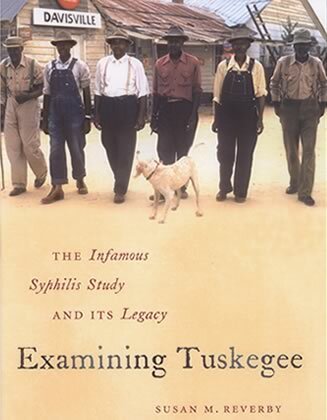 Susan M. Reverby's new book, Examining Tuskegee: The Infamous Syphilis Study and its Legacy (Chapel Hill: University of North Carolina Press, 2009) brings the stories of this extraordinary study up to the present day. In the early 1930s, syphilis — a sexually transmitted disease full of moral stigma and dangerous health effects — was a widespread public health problem in many communities across the country. As part of its effort to reach out to underserved rural black communities in particular, the Rosenwald Foundation and the PHS set up a demonstration project in six southern states to track and treat the disease. When the funds dried up in the Depression, the PHS's idea was to study in one county what happened without treatment to those assumed to no longer be contagious and in the disease's last and latent stage. For the next forty years, the PHS came back into Macon County for more tests of the men, tried to follow up those who had left, and promised families money for burial in exchange for the right to autopsy those who died. None of the men were injected with syphilis, as it is often rumored. Not all of the men died of the disease. The doctors were supposed to choose only those not contagious, but some of the men did pass on the disease to their wives and sexual partners, and then possibly on to a fetus in utero. Despite the discovery of penicillin in the 1940s (which might have still helped some, but not all, of the men), despite a civil rights movement that engulfed the Tuskegee area, despite debates over the power of physicians, despite questions of morality of this research raised in the 1950s, the Study continued. Moving away from seeing the men as just hapless victims and the doctors as racist monsters, Reverby captures the experiences of individuals in the Study. She finds examples of how the men might have gotten to treatment, despite the PHS's efforts. She raises questions about the kinds of medicines available for syphilis in its latent stages and what type of medical uncertainty the Study was supposed to explore. She separates out the concepts of supposed biological difference based on "race" and the practices of institutional racism. In 1997, after much organizing from citizens and politicians, then president Bill Clinton apologized to the six remaining men from the Study and to all African Americans. Nearly forty years after the Study ended and ten years after the formal apology, "Tuskegee" is still invoked to explain the anger and fears of some black Americans over the betrayals of the federal government, the institutional racism in health care, and why medical research has to be reviewed and monitored. In her book, Susan M. Reverby traces both what happened during those forty years, how differing individuals experienced and explained their participation, and how the Study has been remembered and evoked over the decades. She examines the Study's life in history, memory, bioethics, fiction, and political argument, exploring why evoking "Tuskegee" may not be a solution to treating racism in medicine and public health.